class="archive tag tag-asf tag-2178 custom-background group-blog masthead-fixed list-view full-width wpb-js-composer js-comp-ver-5.7 vc_responsive"
With The global African swine fever (ASF) outbreak in China is wreaking havoc on the international pork industry. Fortunately, ASF is not in the United States at this time, but the possibility of it or another foreign animal disease (FAD), means that American pig farmers must take the necessary steps to protect their farms and the domestic pork industry. As U.S. pig farmers know, a robust export market is critical to the ongoing success of the nation’s pork industry. In 2018, U.S. pork and pork variety meat exports totaled 5.37 billion pounds valued at $6.392 billion, according to USDA. If an FAD such as ASF entered the United States, it would likely eliminate this entire valuation to zero for an unknown amount of time. Taking steps to prevent it from occurring require immediate action such as those outlined in resources in this newsletter and found at www.pork.org/fad. To help guard against FADs, consider using these checklists and fact sheets for pigs raised indoors or outdoors. They stress the importance of having an enhanced biosecurity plan in place that is unique to your own farm’s needs. To help ensure none of these signs are overlooked, be sure to get your free hard copies of FAD Barn Posters and fact sheets from the Pork Checkoff in English or Spanish by going to the Pork Store via pork.org. With the official report coming late last week that the island province of Hainan was positive for African swine fever (ASF), China is now essentially ASF-positive in its entirety. In the west, Xinjiang was found to be positive in early April, followed shortly by Tibet. The only areas not known to be ASF-positive now are the city-based zones of Hong Kong and Macau, which are in the extreme south of China. Since its discovery in China in August 2018, Rabobank estimates that ASF has affected 150 million to 200 million pigs, which is nearly 30% larger than annual U.S. pork production and equivalent to Europe’s annual pork supply. These losses cannot easily be replaced by other proteins (chicken, duck, seafood, beef and lamb), nor will larger imports be able to fully offset the loss. The firm believes this will result in a net supply gap of almost 10 million metric tons in the total 2019 animal protein supply, which could be a leading driver of recent pork import announcements. The recent notice by the OIE, which flagged Cambodia as being positive for ASF, revealed that 400 pigs died from the disease and another 100 pigs were culled. The outbreak is in the northeastern-most Rattanakiri province bordering Vietnam, which was itself found to be ASF-positive on Feb. 19. Most of Vietnam’s 556 cases of ASF outbreak have occurred in this northern area. Some Vietnamese officials have said that the virus may have entered the country via people who brought infected pigs from China or from China-made hog feed. 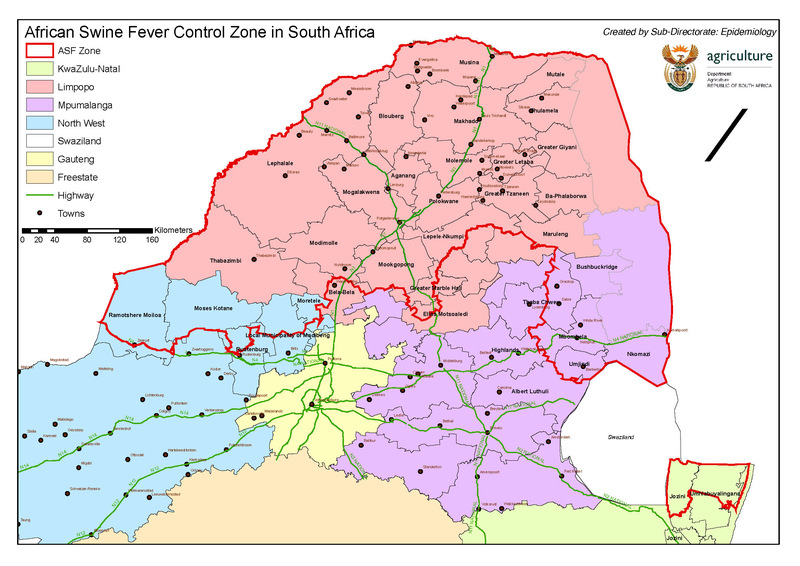 In a report by the World Organization for Animal Health last week, South Africa now has a case of ASF outside of its ASF control zone (in blue area on map beyond red line of control zone). The announcement was triggered by news of a small pig farm in the country’s North West province where 32 of 36 pigs died. 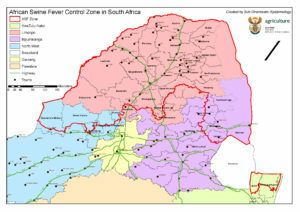 Since this was outside of South Africa’s control zone for the disease, contact with infected wild pigs is suspected.